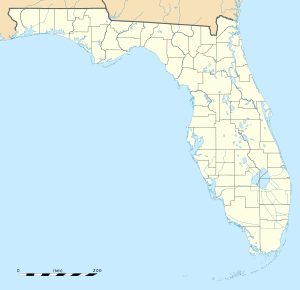 Eglin Air Force Base (AFB) (IATA: VPS, ICAO: KVPS, FAA Location identifier: VPS) is a United States Air Force base located approximately 3 miles (5 kilometers) southwest of Valparaiso, Florida in Okaloosa County. Eglin is a Air Force Materiel Command (AFMC) base serving as the focal point for all Air Force armaments. Eglin is responsible for the development, acquisition, testing, deployment and sustainment of all air-delivered non-nuclear weapons. Severe weather testing of aircraft and other equipment is carried out here at the McKinley Climatic Laboratory. The residential portion of the base is a census-designated place; its population was 8,082 at the 2000 census. Eglin Air Force Base has 2,359 military family housing units. Unmarried junior enlisted members generally live in one of Eglin’s seven dormitories located near the dining hall, chapel, base gym, Enlisted Club and bus lines on base. Each individual unit generally handles dormitory assignments. Bachelor Officer Quarters are not available. Several units and one dormitory are currently being renovated in 2011. The base covers 463,128 acres (1,874.2 km²). Eglin is also one of the few military air bases in the U.S. to have scheduled passenger airline service as the Northwest Florida Regional Airport (VPS) is co-located on the base property. F-15C of the 33d Fighter Wing. An A-10 Thunderbolt fires an AGM-65 Maverick missile over the Eglin range during a Combat Hammer Air-to-Ground Weapons System Evaluation Program (WSEP) mission, which are conducted by Eglin's 86th Fighter Weapons Squadron (FWS). An F-16 Fighting Falcon from the 40th Flight Test Squadron of Eglin Air Force Base refuels from a KC-10 Extender during Air & Space Power Expo '99. May 1992 air-to-air view of an F-16 Fighting Falcon equipped with an AGM-84 Harpoon all-weather anti-ship missile over Eglin Air Force Base. Note Air Force Systems Command badge on vertical fin. An AC-130A Spectre gunship aircraft, 55-011, performs a pylon turn over Range 77 during a training mission in 1984. The aircraft was from the 919th Special Operations Group at Eglin's Duke Field, retired to AMARC on 15 November 1994. This late afternoon view looks south with Santa Rosa Sound, Santa Rosa Island, home of Eglin missile launch sites since 1944, and the Gulf of Mexico beyond. A 58th Aircraft Maintenance Unit crew chief marshals an F-15 Eagle ready to takeoff for a simulated Operation Noble Eagle tasking during a 33rd Fighter Wing exercise. The 96 TW is the test and evaluation wing for Air Force air-delivered weapons, navigation and guidance systems, Command and Control (C2) systems, and Air Force Special Operations Command systems. The Eglin Gulf Test Range provides approximately 130,000 square miles (340,000 km2) of over water airspace. The 96 TW supports other tenant units on the installation with traditional military services as well as all the services of a small city, to include civil engineering, personnel, logistics, communications, computer, medical, security. The 96 TW reports to the Air Force Test Center at Edwards AFB. The 33d FW “Nomads” is the largest tenant unit at Eglin. The 33 FW is a joint graduate flying and maintenance training wing for the F-35 Lightning II, organized under Air Education and Training Command's 19th Air Force. First established as the 33d Pursuit Group, the wing’s contribution to tactical airpower during its 50-year history has been significant with participation in campaigns around the world, while flying various fighter aircraft. Reactivated at Eglin on 1 April 1965 with F-4C Phantom IIs, the wing operated, successively, F-4D and E models into the 1970s before transitioning to the F-15 Eagle. As of 1 October 2009, the 33d FW transitioned to a training wing for the new F-35 Joint Strike Fighter (JSF). The final F-15s assigned to the 33d departed the base in September 2009. As the first of its kind in the Department of Defense, the joint wing is responsible for F-35 JSF pilot and maintainer training for the Air Force, Marine Corps and the Navy. The first of 59 F-35s arrived from Fort Worth, Texas on 14 July 2011. The 58th FS "Mighty Gorillas" are authorized to operate 24 assigned F-35A aircraft, planning and executing a training curriculum in support of Air Force and international partner pilot training requirements. The F-35A is a conventional-takeoff-and-landing low-observable multi-role fighter aircraft, designed with 5th-generation sensors and weapons, and is able to perform air superiority, air interdiction and close air support missions. The F-35A made its first flight on Dec. 15, 2006. The VMFAT-501 "Warlords" are authorized to operate 20 assigned F-35B aircraft, planning and executing a training curriculum in support of Marine and international partner training requirements. The F-35B is a short-takeoff/vertical-landing low-observable multi-role fighter aircraft, designed to provide overwhelming front-line firepower in support of Marine ground forces. The F-35B uses a specially-designed shaft-driven lift fan system to achieve vertical lift and will be able to operate from ship-to-shore and austere battlefield locations. The F-35B made its first flight on June 11, 2008. The VFA-101 "Grim Reapers" are authorize operate 15 assigned F-35C aircraft, planning and executing a training curriculum in support of Navy aviator training requirements. The F-35C is a carrier-capable low-observable multi-role fighter aircraft, designed to provide unmatched airborne power projection from the sea. The F-35C bears structural modifications from the other variants, necessitated by the increased resiliency required for carrier operations. The 53 WG is headquartered at Eglin and serves as the Air Force’s focal point for operational test and evaluation of armament and avionics, aircrew training devices, chemical defense, aerial reconnaissance improvements, electronic warfare systems, and is responsible for the QF-4 Phantom II Full Scale Aerial Target (FSAT) program and subscale drone programs (located at Tyndall Air Force Base, Florida). The wing tests every fighter, bomber, unmanned aerial vehicle, and associated weapon system in the Air Force inventory. The wing reports to the USAF Air Warfare Center at Nellis Air Force Base, Nevada, a Direct Reporting Unit (DRU) to Headquarters, Air Combat Command (ACC). The squadron plans, executes and reports ACC's weapon system evaluation programs for bombers (B-52, B-1 and B-2) and nuclear-capable fighters (F-15E Strike Eagle and F-16). These evaluations include operational effectiveness and suitability, command and control, performance of aircraft hardware and software systems, employment tactics, and accuracy and reliability of associated precision weapons. These weapons include air-launched cruise missiles, standoff missiles, and gravity bombs. Results and conclusions support acquisition decisions and development of war plans. The unit also performs operational testing on new systems and tactics development for the B-52. The Armament Directorate, located at Eglin Air Force Base, Fla., is responsible for cradle-to-grave management of air and ground dominance weapon system programs equipping warfighters with strike weapons to fight and win decisively. Led by the Air Force Program Executive Officer for Weapons, the directorate concurrently reports to the Secretary of the Air Force for Acquisition, Washington, D.C. and the Air Force Life Cycle Management Center, Wright Patterson Air Force Base, Ohio. AFRL/RW develops, demonstrates, and transitions science and technology for air-launched munitions for defeating ground fixed, mobile/relocatable, air and space targets to assure pre-eminence of U.S. air and space forces. The directorate conducts basic research, exploratory development, and advanced development and demonstrations. It also participates in programs focused on technology transfer, dual-use technology and small business development. The directorate is dedicated to providing the Air Force with a strong revolutionary and evolutionary technology base upon which future air-delivered munitions can be developed to neutralize potential threats to the United States. In 2011, the United States Army's 7th Special Forces Group relocated to a newly constructed cantonment on the Eglin Air Force Base reservation from Fort Bragg, as part of the 2005 Base Realignment and Closure (BRAC) round realigning Fort Bragg. It is tasked with conducting special operations in Latin America. The 919 SOW, located about five miles (8 kilometers) south of Crestview and 20 miles (32 km) from Eglin main at Eglin AFB Auxiliary Field No. 3 (Duke Field) and is the only special operations wing in the Air Force Reserve Command (AFRC). In wartime or a contingency, the 919 SOW reports to Air Force Special Operations Command (AFSOC) at Hurlburt Field, Florida, its gaining major command. The mission of the 20 SCS is to detect, track, identify, and report near earth and deep space objects in earth’s orbit, and provide space object identification data in support of United States Strategic Command’s space control mission. A unit of the Air Force Space Command (AFSPC), the men and women of the 20th SCS operate and maintain the AN/FPS-85 radar, the Air Force’s only phased-array radar dedicated to tracking earth-orbiting objects. Eglin AFB Auxiliary Field No. 6 (Biancur Field) is the site of Camp James E. Rudder and the home of the U.S. Army’s 6th Ranger Training Battalion. The 6th RTB conducts the final phase of the U.S. Army Ranger Course. The entire course is 61 days long and is divided into three phases. Each phase is conducted at different geographical and environmental locations. Its mission at Eglin is to expose Ranger students to a fast-paced field training exercise during an 18-day cycle at Eglin. The Naval School of Explosive Ordnance Disposal (NAVSCOLEOD) is a Navy-managed command, jointly staffed by Army, Navy, Air Force, and Marine Corps personnel. NAVSCOLEOD had its official ribbon cutting on the new consolidated training facility in April 1999. This is a subordinate, functional command of U.S. Joint Forces Command (USJFCOM), tasked with improving the integration, interoperability, and effectiveness of Joint fires. The Air Force Operational Test and Evaluation Center stood up Detachment 2 at Eglin to meet the growing demand to provide realistic operational testing for new and modified weapon systems. Since then, Detachment 2 has partnered with the warfighter and the developmental test community to provide the most thorough and rigorous operational test programs found anywhere in the world. Eglin Air Force Base evolved from the 1933 creation of the Valparaiso Airport, when an arrowhead-shaped parcel of 137 acres (0.55 km2) was cleared for use as an airdrome. In 1931, personnel of the Air Corps Tactical School, newly relocated to Maxwell Field, Alabama, sought a location for a bombing and gunnery range. They saw the potential of the sparsely populated forested areas surrounding Valparaiso and the vast expanse of the adjacent Gulf of Mexico. With the outbreak of war in Europe, a proving ground for aircraft armament was established at Eglin. The U.S. Forestry ceded to the War Department the Choctawhatchee National Forest on 18 October 1940. At its peak during World War II, the base employed more than 1,000 officers, 10,000 enlisted personnel and 4,000 civilians. After the war, Eglin became a pioneer in developing the techniques for missile launching and handling; and the development of drone or pilotless aircraft beginning with the Republic-Ford JB-2 Loon, an American copy of the V-1. The 1st Experimental Guided Missiles Group was activated at Eglin Field, Florida, on 6 February 1946, operating out of Auxiliary Field 3. By March 1950, the 550th Guided Missiles Wing, comprising the 1st and 2nd Guided Missile Squadrons, had replaced the 1st Experimental Guided Missiles Group. The 2nd Guided Missile Squadron, SSM, had 62 pilots manning 14 B-17s, three B-29s, and four F-80 Shooting Stars, yellow-tailed drone aircraft used in the role of testing guided missiles. In December 1955, the Air Munitions Development Laboratory was reassigned from the Wright Air Development Center at Wright-Patterson AFB, Ohio, to the Air Force Armament Center at Eglin by Headquarters Air Research and Development Command. The responsibility for development of guns, bombs, rockets, fuses, guided missile warheads and other related equipment in the armament field was transferred from the Dayton, Ohio facility at this time. Work on nuclear weapons was not included in this mission. The USAF Special Air Warfare Center was activated 27 April 1962, with the 1st Combat Applications Group (CAG) organized as a combat systems development and test agency under the SAWC. The 1st CAG concentrated on testing and evaluation of primarily short-term projects which might improve Air Force counter-insurgency (COIN) operations. The Special Air Warfare Center, located at Hurlburt Field, undertook to develop tactical air doctrine while training crews for special air warfare in places like Southeast Asia. By mid-1963, SAW groups were in Vietnam and Panama. The USAF Tactical Air Warfare Center was activated on 1 November 1963. It would be re-designated as the USAF Air Warfare Center on 1 October 1991. With the increasing U.S. involvement in Southeast Asia in the 1960s, the need for increased emphasis on conventional weapons development made Eglin's mission even more important. On 1 August 1968, the Air Proving Ground Center was redesignated the Armament Development and Test Center to centralize responsibility for research, development, test and evaluation, and initial acquisition of non-nuclear munitions for the Air Force. On 1 October 1979, the Center was given division status. The Armament Division, redesignated Munitions Systems Division on 15 March 1989, placed into production the precision-guided munitions for the laser, television, and infrared guided bombs; two anti-armor weapon systems; and an improved hard target weapon, the GBU-28, used in Operation Desert Storm during the Persian Gulf War. The Division was also responsible for developing the Advanced Medium Range Air-to-Air Missile (AMRAAM), an Air Force-led joint project with the U.S. Navy. The Air Force Armament Museum was founded on base in 1975. In 1981 the original building housing the museum was condemned and the facility closed until 1984. Selected on 27 April 1975, the installation served as one of four main U.S. Vietnamese Refugee Processing Centers operated by the Interagency Task Force for Indochina Refugees, where base personnel housed and processed more than 10,000 Southeast Asian refugees, the first 374 of which arrived on board a Northwest Orient Boeing 747 on 4 May 1975. In 1978, the USAF Tactical Air Warfare Center assumed responsibility for the USAF Air Ground Operations School. In the same year, the Electronic Warfare Evaluation Program became another one of the USAFTAWC's weapons system evaluation programs, and resulted in the activation of the 4487th Electronic Warfare Aggressor Squadron in 1990. Construction began in 1984 on the Bob Hope Village, the only retirement facility that caters to enlisted military, opening in February 1985. Residents pay below market value for the 256 independent apartments. Col. Bob Gates, Bob Hope's USO pilot, was key in getting the comedian's support for the undertaking, as well as lending his name and prestige to the project. He was named an honorary board member of the foundation in 1978 and held benefit concerts for nearly two decades. During a 1992 reorganization, the Air Force disestablished Eglin's parent major command, Air Force Systems Command (AFSC) and merged its functions with the former Air Force Logistics Command (AFLC). The newly created major command from this merger, Air Force Material Command (AFMC), remains Eglin's parent command to this day. The Development Test Center, Eglin's host unit, became part of AFMC on 30 June 1992. The 46th Test Wing replaced the 3246th Test Wing in October 1992. On 10 August 1994 construction began on the All Conflicts' Veterans War Memorial on the site of the old POW/MIA memorial on the western end of Eglin Boulevard. The memorial was dedicated on 15 August 1995. As part of the military drawdown in the 1990s, the Air Force inactivated the 33d Fighter Wing's 59th Fighter Squadron on 15 April 1999. The wing lost six aircraft and consolidated the remaining aircraft into the 58th and 60th Fighter Squadrons. Originally selected for inactivation in 1997, Air Force officials delayed the decision in recognition of the Nomads' connection with Khobar Towers. The 59th reactivated as the 59th Test and Evaluation Squadron on 3 December 2004, at Nellis Air Force Base, Nevada. The 59th falls under the 53rd Test Management Group at Eglin. In July 2012 the Air Armament Center (AAC) was inactivated. The center had planned, directed and conducted test and evaluation of U.S. and allied air armament, navigation and guidance systems, and commanded and controlled systems. It operated two Air Force installations, providing host support not only to Eglin, but also Kirtland AFB, New Mexico. It had included the Armament Product Directorate (Eglin AFB, FL), the 46th Test Wing (Eglin AFB, FL), the 96th Air Base Wing (Eglin AFB, FL), and the 377th Air Base Wing (Kirtland AFB, NM). Initial construction of a railroad line into the region had been discussed as early as 1927 as part of the Choctawhatchee and Northern Railroad, though military-use proposals didn't come forward until 1941. German POWs were used in clearing and grading the alignment during World War II. There was one commercial customer served by the line, a lumber pulp yard at Niceville which is now community athletic fields. The line was later abandoned in the late 1970s and the southern end, west of State Road 285, lifted by the mid-1980s. A number of auxiliary fields were constructed on the Eglin reservation during World War II, many of which are still in service in various roles, either in support of flight operations or special test activities. Work on Auxiliary Field 1 began 27 November 1940. Auxiliary Field 1 is named Wagner Field for Maj. Walter J. Wagner, former commanding officer for the 1st Proving Ground, Eglin Field, who was killed 10 October 1943 in the crash of AT-6C-NT Texan, 41-32187, c/n 88-9677, at Auxiliary Field 2. Much Doolittle Raid and Operation Credible Sport training took place here. The U.S. Navy used the field as an auxiliary facility for pilot training out of Whiting Field for a time, dating from early 1960. A proposal by the National Aeronautics and Space Administration to build a multi-million dollar research installation for testing rocket fuels and components at Field 1 in early 1960 was dropped in mid-February, the chief reason for consideration being abandoned "was the possibilty the military would have other uses for the field in the near future." It is also known as Site C-5. Range C-72 extends SE from Wagner Field. Auxiliary Field 2 is named Pierce Field for Lt. Col. George E. Pierce, killed 19 January 1942 while piloting B-25C-1 Mitchell,41-13118, which crashed into the Gulf of Mexico 2 miles (3.2 km) S of Destin, Florida. Joe Baugher cites date of 19 October 1942 for loss. It is also known as Site C-3. Between November 1966 and 1970, it was the site of the 560th Civil Engineering Squadron, also known as the Civil Engineering Field Activities Center, for the training of RED HORSE personnel. Auxiliary Field 3 is named Duke Field for 1st Lt Robert L. Duke, killed in the crash of Curtiss A-25A-20-CS Shrike, 42-79823, near Spencer, Tennessee, on 29 December 1943. He was assigned as Assistant A-3 of Eglin Field. Used as the set for the fictional 918th Bomb Group in the 1949 film Twelve O'Clock High. Field 3 was long-associated with drone operations of the 3200th and 3205th Drone Groups. Aircraft were "sanitized" (stripped of all identification) here for the failed Bay of Pigs Invasion of Cuba. Auxiliary Field 4 is named Peel Field for 2nd Lt. Garland O. Peel Jr., who died in the take-off crash of Martin B-12AM, 33-262, of the 387th School Squadron, 2 January 1942, when he suffered engine failure. He was a gunnery school instructor at Eglin. Peel Field was utilized for the filming of scenes for the 1944 film Thirty Seconds Over Tokyo. Wartime temporary housing for NCOs located here was razed in the 1960s. In the early 1960s, while in a moribund state, one of the runways was used as an unofficial auto drag strip by local civilians. The ramp of the non-flight-rated facility now serves as a vehicle park for aircraft and armor after being expended as targets on the Eglin ranges. Auxiliary Field 5 is named Piccolo Field for Capt. Anthony D. Piccolo, who died in the crash of AT-6A-NT Texan, 41-16372, on 6 October 1942. Piccolo was the commanding officer of the 386th Single Engine Gunnery Training Squadron at Eglin. Today, the area is due north of Field Four and serves as a microwave station. A 60-foot radar antenna was installed here in April 1961. On most base maps, it is identified as Site C-4. Doolittle Raid training was conducted here. Auxiliary Field 6 is named Biancur Field for 1st Lt. Andrew Biancur, a test pilot of the Medium Bombardment Section of the 1st Proving Ground Group, killed 8 January 1944 in the crash of YP-61-NO Black Widow, 41-18883, c/n 711, at Eglin Field. The U.S. Army Ranger facility Camp Rudder is located here. It is designated Site B-6. The X-43A-LS low-speed demonstrator underwent testing out of Auxiliary Field 6 in November 2003. Auxiliary Field 7 is named Epler Field for Col. Robin E. Epler, deputy commander (Technical) of the Air Proving Ground Command, Eglin Field, Florida, killed 28 January 1944 in the crash of A-20G-10-DO Havoc, 42-54016, one mile (1.6 km) NE of Crestview, Florida. It is designated Site B-12. Auxiliary Field 8 is named Baldsiefen Field for 2nd Lt. Richard Edward Baldsiefen, a gunnery instructor at Eglin, killed 4 March 1942 along with Lt. John W. Smith, in the crash of AT-6A-NA Texan, 41-528, which came down at Auxiliary Field 4. It is designated Site C-52C. Auxiliary Field 9 is named Hurlburt Field for Lt. Donald Wilson Hurlburt, killed 1 October 1943 when his Lockheed AT-18-LO Hudson gunnery trainer, 42-55591, c/n 414-7313, crashed during take-off at Eglin. After flying B-17 combat missions from Great Britain and receiving the Distinguished Flying Cross (DFC), Hurlburt was assigned in mid-1943 to the First Proving Ground Electronics Test Unit at Eglin Field. Field 9 was named in his honor by base commander General Grandison Gardner. Hurlburt's nephew was Captain Craig D. Button (noted for his mysterious flight and crash of an A-10 Thunderbolt on 2 April 1997). An official history of Eglin AFB's early years cites 2 October 1943 as the date of this accident. Auxiliary Field 10 is the western-most of the wartime Eglin airfields, located in Santa Rosa County, and is named Dillon Field for Capt. Barclay H. Dillon, test pilot of the Fighter Section of the 1st Proving Ground Group, killed 2 October 1943 when P-38J-5-LO Lightning, 42-67103, crashed 8 miles (13 km) W of Milton, Florida. Field 10 was later named Eglin Dillon Airdrome. Now used primarily for U.S. Navy basic flight training, the Navy refers to it as Choctaw Naval Outlying Field (OLF). It is also used for Unmanned Aerial Vehicle [UAV] training, and it is expected that F-35 Lightning IIs assigned to the 33d Fighter Wing at Eglin Air Force Base will utilize OLF Choctaw for training. Auxiliary Field 11 is an unconfirmed name for a RED HORSE unsurfaced airstrip that shows up on Google Earth in Walton County. The Santa Rosa Island Range Complex is part of the Eglin overwater range that provides 86,500 square miles of overwater airspace that is jointly used for a variety of test and evaluation activities and training exercises. As of the census of 2000, there were 8,082 people, 2,302 households, and 2,262 families residing on the base. The population density was 2,640.1 people per square mile (1,019.8/km²). There were 2,320 housing units at an average density of 757.9/sq mi (292.7/km²). The racial makeup of the base was 71.8% White, 14.8% Black or African American, 0.5% Native American, 3.0% Asian, 0.4% Pacific Islander, 4.2% from other races, and 5.3% from two or more races. Hispanic or Latino of any race were 11.2% of the population. On October 6, 1997, the McKinley Climatic Laboratory was added to the U.S. National Register of Historic Places. Author Hunter S Thompson served here in the 1950s. Three movies have been filmed in part at Eglin Air Force Base or its outlying auxiliary airfields, Thirty Seconds Over Tokyo in 1944, Twelve O' Clock High in 1949, and On the Threshold of Space in 1955. Several Tom Clancy novels refer to "raking the sand traps on the officers' golf course" at Eglin as a common activity for low-security prisoners at the associated Federal Prison Camp, Eglin, now closed. F-15 Eagles from Eglin's 33rd Fighter Wing, 59th Fighter Squadron, were used in the filming of the 1997 movie Air Force One. The area gets only 50 to 60 days of annual precipitation or more rainfall. There are few days without sunshine, which allows year-round outdoor activities. The forests and shores of Eglin Air Force Base are at the center of one of the most biodiverse locations in North America. Over 50 species threatened in Florida are found on the base, including sea turtles that nest on its white-sand beaches and red-cockaded woodpeckers that thrive in its longleaf pine forests. The base has a natural resources management team that constantly monitors important species within the base with the goal of balancing their national defense mission with environmental stewardship. Longleaf pine forest, a forest type reduced to 5% of its former range in the last few centuries, covers 200,000 acres (810 km2) of the base. Part of this forest, 6,795 acres (27.50 km2), is old growth, making the base home to one of the most extensive old-growth longleaf pine forests in the world. In order to deal with the high noise levels of the Lockheed Martin F-35 Lightning II, officials from Santa Rosa, Okaloosa and Walton counties are studying which homes, businesses and public buildings will require additional noise protection. Eglin Air Force Base was also a launch site for civil rockets of NASA. There are three launch pads: one at 29.6700 N, 85.3700 W at Cape San Blas; and two on Santa Rosa Island at 30.3800 N, 86.7400 W and 30.3800 N, 86.8170 W. Rockets launched here have included Arcas, Nike Cajun, Nike Apaches, and Nike Iroquois. This site was formerly operated by the 4751st ADMS with CIM-10 Bomarcs, which inactivated in 1979. In the 1940s, captured V-1 flying bombs and American copies, Republic-Ford JB-2 LOONs, were launched out over the Gulf of Mexico from these sites. Two concrete launch ramps were placed on the National Register of Historic Places in 1996. A rusting Loon launch ramp still exists at Auxiliary Field 1, Wagner Field. Eglin is known to have been used for 441 launches from 1959 to 1980, reaching up to 686 kilometers altitude. ↑ Franks, Staff Sgt. Bryan, 33d Fighter Wing Public Affairs, "First of the F-15C Eagles fly away", The Eglin Dispatch, Northwest Florida Daily News, Fort Walton Beach, Florida, 11 June 2008, Vol. 2, No. 28, p. 2. 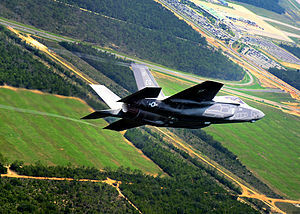 ↑ First F-35 arrives at Eglin Air Force Base | eglin, first, afb – Northwest Florida Daily News. Nwfdailynews.com (2011-07-14). Retrieved on 2011-10-31. ↑ Hutchinson, Leonard Patrick, "History of the Playground Area of Northwest Florida", Great Outdoors Publishing Co., St. Petersburg, Florida, 1st ed., 1961, no Library of Congress card number, no ISBN, p. 84. ↑ Special, "From Dayton, Ohio – Munitions Lab Is Transferred to Eglin AFAC", Playground News, Fort Walton Beach, Florida, 15 December 1955, Vol. 9, No. 97, p. 1. ↑ Mueller, Robert, "Air Force Bases Vol. 1: Active Air Force Bases Within the United States of America on 17 September 1982", United States Air Force Historical Research Center, Office of Air Force History, Washington, D.C., 1989, ISBN 0-912799-53-6, p. 136. ↑ 11.0 11.1 Eglin Air Force Base – Fact Sheet (Printable) : HISTORY OF THE 53RD WING. Eglin.af.mil. Retrieved on 2011-10-31. ↑ Braxton, Sheila, "Refugees Arrive; 514 Due in Today", Playground Daily News, Fort Walton Beach, Florida, Monday 5 May 1975, Volume 30, Number 75, page 1A. ↑ Moore, Mona, "25 years of Hope: Village's annual luau will honor Col. Bob Gates, pilot for comedian Bob Hope", Northwest Florida Daily News, Fort Walton Beach, Florida, 29 May 2010. ↑ 25 years of Hope: Village's annual luau will honor Col. Bob Gates, pilot for comedian Bob Hope | Government > Government Bodies & Offices from. AllBusiness.com. Retrieved on 2011-10-31. ↑ Wenzel, Tracy, Daily News Staff Writer, "Eglin host unit is reorganized", Northwest Florida Daily News, Fort Walton Beach, Florida, 1 July 1992, Vol. 47, No. 146, p. 1B. ↑ Factsheets : Historical Eglin events in August. Eglin.af.mil. Retrieved on 2011-10-31. ↑ Reorganization, technology, triumphs and tragedies: Eglin in the '90s | eglin, tragedies, 90s – News. TheDestinLog.com. Retrieved on 2011-10-31. ↑ 20.0 20.1 USAAF/USAF Accidents for Florida. Accident-Report.com. Retrieved on 2011-10-31. ↑ 1941 USAAF Serial Numbers (41-30848 to 41-39600). Joebaugher.com. Retrieved on 2011-10-31. ↑ Crestview, Florida, "Navy Will Start Using Field 1 at Eglin AFB Soon", The Okaloosa News-Journal, Thursday 11 February 1960, Volume 46, Number 6, page B-4. ↑ Crestview, Florida, "Area Loses Proposed Projects – Rocket Facility East And Navy Auxiliary Jet Field West Cancelled", The Okaloosa News-Journal, Thursday 18 February 1960, Volume 46, Number 7, page A-1. ↑ 24.0 24.1 24.2 USAAF/USAF Accidents for Florida. Accident-Report.com. Retrieved on 2011-10-31. ↑ January 1942 USAAF Accident Reports. Aviationarchaeology.com. Retrieved on 2011-10-31. ↑ 28.0 28.1 28.2 Factsheets : Eglin Air Force Base History. Eglin.af.mil. Retrieved on 2011-10-31. ↑ Eglin in the movies. (PDF) . Retrieved on 2011-10-31. ↑ 30.0 30.1 USAAF/USAF Accidents for Florida. Accident-Report.com. Retrieved on 2011-10-31. ↑ NASA.gov. Researchernews.larc.nasa.gov. Retrieved on 2011-10-31. ↑ Crestview, Florida, "Two Eglin Field Flyers Die in Crash Wednesday", Okaloosa News-Journal, 6 March 1942, Vol. 28, No. 7, p. 1. ↑ 1942 USAAF Serial Numbers (42-50027 to 42-57212). Joebaugher.com. Retrieved on 2011-10-31. ↑ 34.0 34.1 Angell, p. 105. ↑ Master Sgt. Russell P. Petcoff (29 July 2010). "Eglin chosen as preferred alternative F-35 base". Eglin.af.mil. http://www.eglin.af.mil/news/story.asp?id=123215465. Retrieved 2010-09-16. ↑ "Local crew called on to defend 'Air Force One|(film),'" Northwest Florida Daily News, Fort Walton Beach, Florida, 13 July 1997, p. 1B. ↑ Tech. Sgt. Mark Kinkade (August 2004). "Eglin's Other World". Airman Magazine of America's Airforce. Archived from the original on 19 March 2006. http://web.archive.org/web/20060319191232/http://www.af.mil/news/airman/0804/eglin.shtml. Retrieved 2 February 2009. ↑ Mary Byrd Davis (23 January 2008). "Old Growth in the East: A Survey. Florida". Archived from the original on 20 August 2008. http://web.archive.org/web/20080820074533/http://www.primalnature.org/ogeast/fl.pdf. ↑ "Eglin". Encyclopedia Astronautica. Mark Wade. http://www.astronautix.com/sites/eglin.htm. ↑ Eglin. Astronautix.com. Retrieved on 2011-10-31. This article incorporates public domain material from the United States Government document "Eglin Air Force Base". This article incorporates public domain material from the United States Government document "Airman magazine online, Organization facilities list". Wikimedia Commons has media related to Eglin Air Force Base.